Editor’s Note: The EU’s neonic ban has not helped Europe’s bees and is causing environmental catastrophe in Europe and beyond as conversion of land to agricultural uses increased to compensate for lost food production. NFU Vice President Guy Smith said: “A blanket ban of neonicotinoids on outdoor crops would be devastating for farms across the country 1. The numbers of pests are rising across the country1 and dealing with these pressures is costly 2. Growing crops without these seed treatments could become very difficult. Editor’s Note: No wonder the EU’s neonic ban isn’t helping Europe’s bees. Translation from the French via Google Translate. From May 1st to May 8th, beekeepers from all over France, both professional and amateur, are required to practice counting varroa, “the number one enemy of bees”. This week should also be an opportunity for beekeepers to exchange on best practices against this scourge. The No. 1 challenge local beekeepers face now is a parasite called the varroa mite, which made its first appearance in the U.S. in the late 1980s. 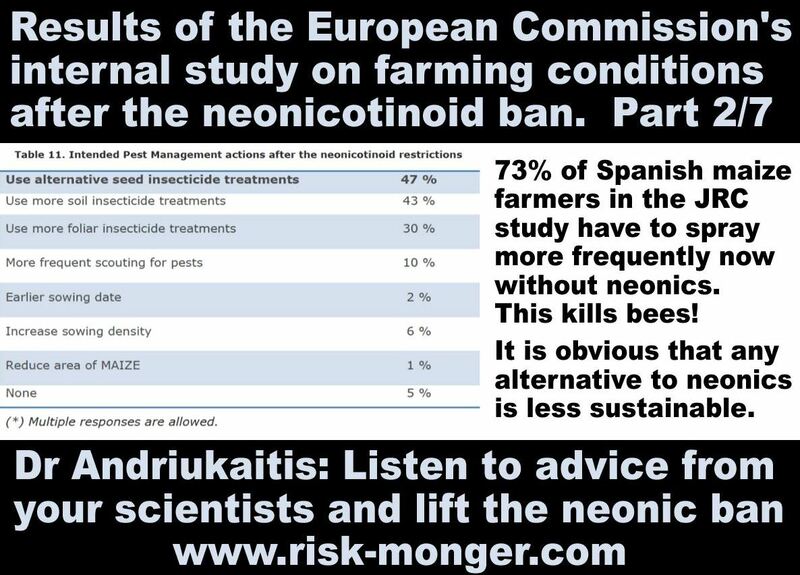 Part 2 of my assessment of the leaked EU Commission study on farming after neonics. . . .
As I read the pages of this internal study on the effects of the Commissions 2013 precautionary ban, I am beginning to realise what a tragic farce this has become. Tragic for farmers, tragic for the environment, tragic for bees. Because chemophobes seem to have influence in Juncker’s cabinet, the Commission is not releasing this publicly funded study. The honeybee’s single biggest enemy in the U.S. and Europe is a parasitic mite aptly named Varroa destructor, first introduced to the United States 30 years ago, when it most likely hitched a ride from its native habitat in Southeast Asia on the back of an infected queen. In a research essay published recently in the Journal of Economic Entomology, Robert Owen argues that human activity is a key driver in the spread of pathogens afflicting the European honey bee and recommends a series of collective actions necessary to stem their spread. As reported by the Entomological Society of America, in the search for answers to the complex health problems and colony losses experienced by honey bees in recent years, it may be time for professionals and hobbyists in the beekeeping industry to look in the mirror. Beth Eiring, quarantine and nursery specialist for the Montana Department of Agriculture, is among those on the front lines of the fight for bee health in Montana, a state which typically ranks in the top five in the U.S. for honey production. Finally, the committee allowed Senate Bill 929, which would have restricted the use of neonicotinoid pesticides, to die without comment. However, critics said that classifying neonicotinoids as restricted use pesticides could steer people to more toxic pesticides that are harmful to people as well as insects.